The first presidential debate of the 2016 election is in the books. Republican nominee Donald Trump went from restrained politician to interrupting cow within minutes, sniffling his way through a solid performance by Democratic nominee Hillary Clinton. The former secretary of state interrupted Trump at times as well, and in a few cases she talked over or completely disregarded moderator Lester Holt's calls to move on or take a break. If you think the debate itself was wild, have a look at Approved News 6's twitter account, which provided parody commentary on fictional events that did not actually transpire during the first debate, but may not have surprised anyone if they had. That's how wild things got on Monday night. According to the joke account, Libertarian candidate Gary Johnson appeared to stay home, choosing to jeer on Twitter rather than own up to the low polling numbers that kept him out of the debate. Green Party candidate Dr. Jill Stein ended up on campus at Hofstra University on Monday, only to be peacefully escorted off-site by authorities due to a lack of proper credentials. In Approve News 6's world, Stein returned with a vengeance, riding a polar bear into the auditorium. Sadly, Stein was removed by security, along with the ferocious wild animal, marking one of many wild moments in this brilliant, satirical saga. 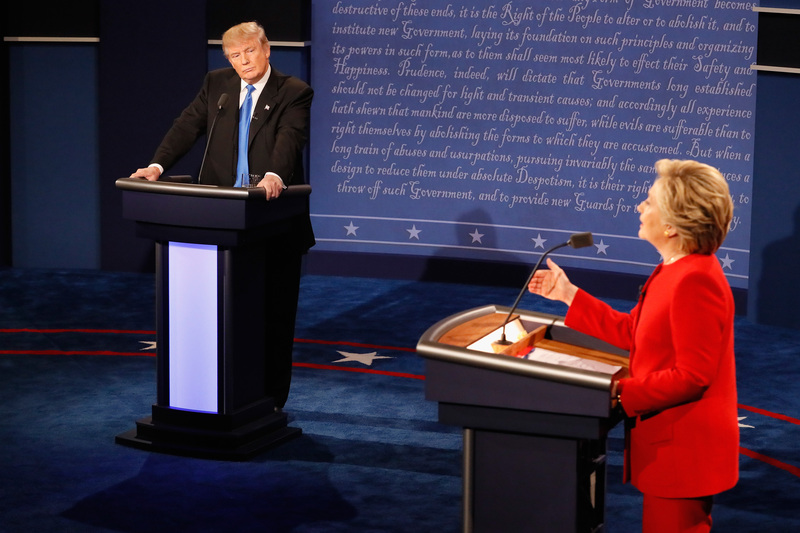 The fictional but awesome sparring match between Clinton and Trump about destroying the sun mirrors oh so many exchanges between the candidates and Holt, who thrust himself into the mix by calling the Donald out on erroneous statements as the two candidates tackled security, economics, and foreign policy issues. You could sub "the sun" for the Donald's denials of stop and frisk being overturned and even Trump's own conspiracy theories, which have included his involvement in the birther movement, as well as his assertion that global warming is a Chinese hoax. Approved News 6's faux non sequiturs are perfectly at home with Trump's own curious statements. There are twist and turns to this Twitter thread that go well beyond a simple lampooning. Things get metaphysical, life-altering orbs appear, prophecies are broken, blood ravens appear, and the power goes out. It's one of the most electric takes on the debate format you'll ever see and perhaps one of the last truly comedic things to come out of the current political field. Imagine what Approved News 6 can do with the vice presidential debate. It's gonna get weird when Tim Kaine and Mike Pence take the stage, and it's going to be wonderful.